Vic McEwan, the artistic director of the Birrego-based CAD Factory, is no stranger to water. His 2013 work Yenda Rain looked at the devastating impact of floodwater on a small, rural community and in the same year, Tipping Point explored the politics of water in relation to the Murray-Darling basin. 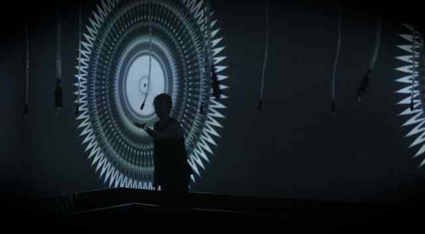 But with his interactive, multimedia installation Almost an embrace, McEwan is happy to look beyond the destructive and political aspects of water and focus on its pleasurable and playful sides. One senses Almost an embrace well before entering the upstairs space at Wagga Wagga Art Gallery. There is a freshness in the air and the sound of running water—an alluring and unusual mix considering we are indoors. Stepping into the space we are quickly won over by what is on offer, and on a fundamental level, our response may well be driven by the fact that 50-75% of our own body mass is made up of water. What we encounter are 20 hoses suspended from the gallery’s ceiling in the outline of a perfect square, each hose yielding a gentle stream of water into a raised, square pool on the floor. 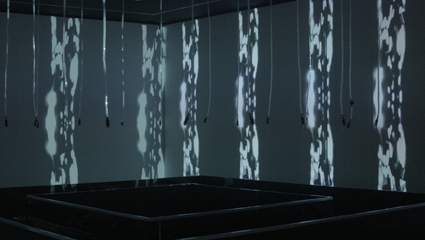 The gallery’s walls complement this movement with 12 column-like projections of glistening, running water. The sense that we glean—within the construct of it all—is of order, beauty and peace. Significantly, the hardware driving the installation is nowhere to be seen; McEwan and his curator, Drew Halyday, have ensured that the purity of the work’s focus is never compromised. Beyond its quiet mode the installation has much more to offer—it is, after all, an interactive work. By placing one hand on the metal rim of the pool and another into the stream from one of the hoses, things quickly begin to shift. Water, electricity and outstretched hands—the “near embrace” of the work’s title—may sound like a dubious combination, but in this instance our safety is guaranteed and by becoming a conductor we effectively close the circuit and push the installation into active mode. Accordingly, the movement of one’s hand up and down the stream, or in and out of it, triggers a percussive soundscape and a more frenetic response from the projectors—psychedelic, even—and the more people ‘playing’ the installation, the busier and more diverse its response becomes. From my perspective, the value of the installation’s active mode has less to do with the sense of play that it offers in the moment and more to do with the contrast that emerges when one steps away from the work and it returns to the Zen-like atmosphere of its quiet mode. This is when the work is at its strongest, a testament to the Modernist maxim that less can indeed be more. But beyond this personal preference it is usually the sum of a work’s parts that defines it and generates its appeal. Based on the enthusiasm with which Almost an embrace is currently being received—by locals and visitors alike—McEwan has every reason to believe that with this work, he is genuinely hitting the mark.